Until recently, astronomers were highly skeptical of whether or not planets should be possible in multiple star systems. It was expected that the constantly varying gravitational force would eventually tug the planet out of orbit. But despite doubts, astronomers have found several planets in just such star systems. Recently, astronomers announced another, this time in the trinary star HD 132563. The detection of the new planet came as part of a larger study on the trinary star system spanning 10 years. The two main stars that comprise the system are both similar to the Sun in mass, although somewhat less prevalent in metals, and orbit each other at a distance of around 400 AU. The main star, HD 132563A is also itself, a binary. This fact was not previously recognized and also reported by the team, led by Silvano Desidera from the Astronomical Observatory in Padova, Italy. The newly discovered planet orbits the secondary star in the system, HD 132563B. As with the binary component of the main star, the new planet was discovered spectroscopically. The planet is at least 1.3 times the mass of Jupiter, with an average distance from its parent star of 2.6 AU, and an moderately high eccentricity of 0.22. The team also attempted to image the planet directly using adaptive optics from the Italian Telescopio Nazionale Galileo. 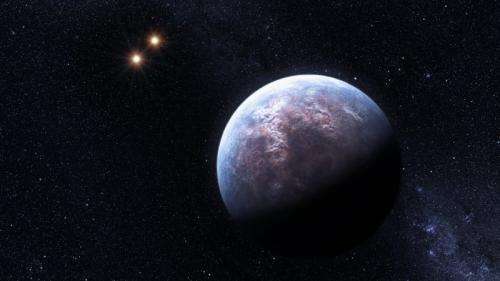 While there was a hint in the glare of the star that may have been the planet in question, the team could not rule out that the detection was not an instrumental effect. With the discovery of this new planet, the total number of discovered planets in multiple star systems lies at eight. while this is rather small numbers from which to draw firm conclusions, it appears that planets can be commonly found orbiting the more remote members of trinary star systems for good periods of time. On the shorter end, the stellar system is anticipated to be 1-3 billion years in aged, based on the amount of stellar activity and amount of lithium present in the stars atmosphere (which decreases with time). However, fitting of the mass and luminosity onto isochrones suggest the stars may be as much as 5 billion years in age. In either situation, the planetary system is dynamically stable. Also based on these eight systems, the team also suggests that planets existing around such far removed members of a multiple star system may be as common as planets around wide binaries, or even single stars. Could this planet be in the liquid water range? It's only about half again as far out as Mars and the star is a little hotter than the sun (~250 K). If the planet or a large satellite had a lot of CO2 or methane in its atmosphere, who knows. Maybe life could exist there. You are better off hoping for a large moon. The planet is larger (well heavier) than Jupiter. The extra warmth from both having a large (primary) planet in the sky and tidal heating should make life possible. So when we reach the stars, our idea of what constitutes a habitable planet will have stretched a lot. Just imagine how much fun Ptolemy would have had had we lived on the moon instead. "There are plenty of them, and by the time that fact becomes important, the populations of Mars, Venus, the moon, and the asteroid belt should each be on the order of Earth's population today"
You don't know much about Venus if you think any life would ever be possible there. The temperature there is far hotter than on Mercury because of the the densely thick sulfuric acid clouds that cause a greenhouse effect and create an 800º+ F surface temperature.